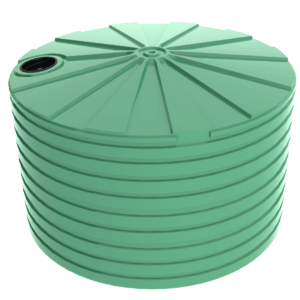 Water tanks are available in a range of suitable materials including plastic, galvanised steel, Aquaplate®, Zincalume®, fibreglass, and concrete. All can be suitable, providing the materials used are at least of food-grade standard (AS2070). If the water is to be used for human consumption the tank material MUST comply with the requirements of potable-water standard (AS/NZS4020). The typical Aussie water tanks that we all remember are the galvanised steel water tanks and until recently this was the most common material used in the manufacture of rainwater tanks. Galvanised steel is not inherently resistant to corrosion but it is now available with rust resistant coatings such as zincalume or Aquaplate. New tanks may leach excess concentrations of zinc which could affect the taste of stored rainwater. These galvanised water tanks may need to be flushed before use. The most common material used in the manufacture of metal rainwater tanks is galvanised steel. Galvanising is the process of applying zinc to steel. These “galvanised” tanks could be soldered or joined. This join creates what is actually a joint or seam. Solder consists of a combination of lead & tin which is melted with a hot iron and applied to a joint. Galvanised steel is not inherently resistant to corrosion and must have rust-resistant coatings applied. Initial corrosion of galvanised steel normally leads to production of a thin adherent film that coats the surface of the tank and provides protection against further corrosion. It is important when cleaning such tanks not to disturb this film. New steel tanks may leach excess concentrations of zinc, which could affect the taste of stored rainwater, but is not a health risk. These tanks may need to be flushed before use. Aquaplate® (plastic coated steel) has a food-grade polymer skin bonded to a galvanised steel base. The polymer used in plastic coated steel is not resistant to prolonged exposure to sunlight, so tanks must have a top cover in place at all times. Kerosene or similar chemicals typically used as mosquito larvicides can cause degeneration of the polymer coating and should not be used. The polymer coating must not be damaged when cleaning or installing the tank. If the coating is damaged, it should be repaired immediately using an appropriate sealant to prevent corrosion of the metal portions of the tank. Steel used in the fabrication of water tanks typically has a stated warranty period of 20 years. While the raw material has a 20yr warranty, the manufactured product (the water tank) has a 10yr warranty, on a pro-rata basis. Always read the warranty. Most steel tank installations require concrete slab, minimum 100mm thick with steel reinforcing, or else you void the warranty. Stainless steel can also be used to manufacture water tanks. This material does not suffer from the rust or corrosion problems typical of galvanised steel tanks. However, the cost is substantially higher than normal plastic coated steel tanks. The stainless steel tanks still require a seam, where the sheets are joined. 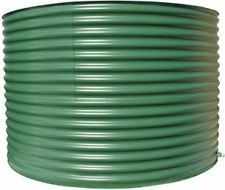 The most popular type of water tank in Australia is the plastic or poly water tank, typically made with the rotational moulding process. These tanks have been made by some manufacturers using this process for over 20years. Plastic tanks and plastic liners must be constructed of materials that are at least of food-grade standard (compliant with AS 2070) and if the water is to be used for human consumption the plastic material must actually comply with the requirements of potable-water standard (AS/NZS4020). The rotational moulding industry is one of the few industries that have a comprehensive standard that covers both the raw materials used, and the manufacturing and workmanship of the completed water tanks. 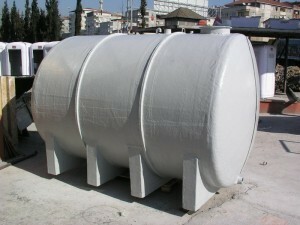 Polyethylene (Poly) is non-corrosive tank material designed for long life. Polyethylene will not rust or suffer from corrosion as will metal water tanks some time during their service life. Poly tanks are lightweight and easy to handle – no heavy equipment needed. Leading manufacturers, such as Bushmans Tanks, use materials that comply with the light transmission standard (AS/NZS4766) that inhibits the growth of algae. Light transmission is a potential problem that fibreglass tanks have a need to manage. One advantage of Fibreglass is that it is very stiff or rigid. This means that tank walls can be relatively thin to manage the water pressure. However the disadvantage of this very rigid material is that it can tend to be brittle in nature, being prone to cracking and leaking. For more information please contact our experts on 1800 0088 8888 or visit www.bushmantanks.com.au. Our representatives are on hand to provide you with information, free quotes, prices and advice and our aim is to respond to all enquiries withing 24 hours.